Yule is the time of the Winter Solstice, and for many Pagans, it's a time to say goodbye to the old, and welcome the new. As the sun returns to the earth, life begins once more. This ritual can be performed by a solitary practitioner, either male or female, but it's also easily adaptable for a small group of people. Perform this ritual on the evening of the Winter Solstice. If you normally wear a ritual robe or ceremonial gown, do so — and feel free to embellish for the season! Consider a crown of holly, a special Yule-themed robe, or adding some sort of holiday bling to your existing robe. Sparkly is good! 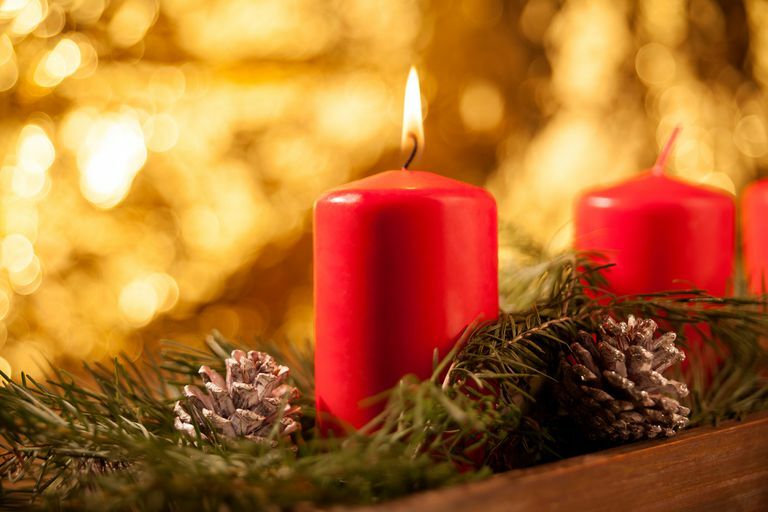 Decorate your altar with a Yule log or tree (although obviously the tree might have to go on the floor, rather than the altar itself), lots of seasonal symbolism, and candles — after all, Yule is a celebration of light. You'll also want to have some holiday incense on your altar. Frankincense, cinnamon, myrrh — all are appropriate to the season; don't light it just yet, though. Finally, have two candles in seasonal colors like red, gold, green, or white. If you normally cast a circle, do so now — but don't worry, it's not mandatory. To begin the ritual, stand at your altar, but don't light the candles just yet. Take a few moments to remember what things must have been like for our ancestors at this time of year. The harvest had been brought in, and they knew that in a few months, their stockpiles of food would be running low. It was the season of darkness, the time when the earth went dormant once more, sleeping until the spring returned. It was cold, often brutally so, and a lack of preparation could mean certain death. Those who didn't plan in advance might starve, freeze, or die of illness. The days were short, the nights were long, and it must have seemed as though spring would never return. Despite all of this, our ancestors knew that despite the darkness of the night and the chill in the air, soon the light would return to the earth, bringing with it life. This night, the Winter Solstice, welcomes back the Sun, the ultimate giver of light. tomorrow, the Sun will begin its journey back to us. a blessing from Earth to her children. It is the season of the winter goddess. the rebirth of the Sun, and the return of light to the Earth. I honor the eternal cycle of birth, life, death and rebirth. the Mother of nature, who rules the season. whose blessings bring new life to the earth. sending my prayers to you upon the air. Light your incense, and if you'd like to make an offering of food, bread, or something else, do so now. As the smoke of the incense rises to the night sky, meditate on what changes you'd like to see before the next Sabbat. Reflect upon the time of the season. Although winter is here, life lies dormant beneath the soil. What new things will you bring to fruition for yourself when the planting season returns? How will you change yourself, and maintain your spirit throughout the cold months? When you are ready, either end the rite, or continue on with additional rituals, such as Cakes and Ale or Drawing Down the Moon. If you don't have a ritual robe, you can take a cleansing bath before the rite, and then wear a simple cotton or other organic material. Another option would be to make a robe as a Yule gift to yourself! Why Do We Celebrate Yule, the Winter Solstice?